DETROIT, MI – Toyota’s luxury division introduced a hot new sports coupe here today before a packed hall. 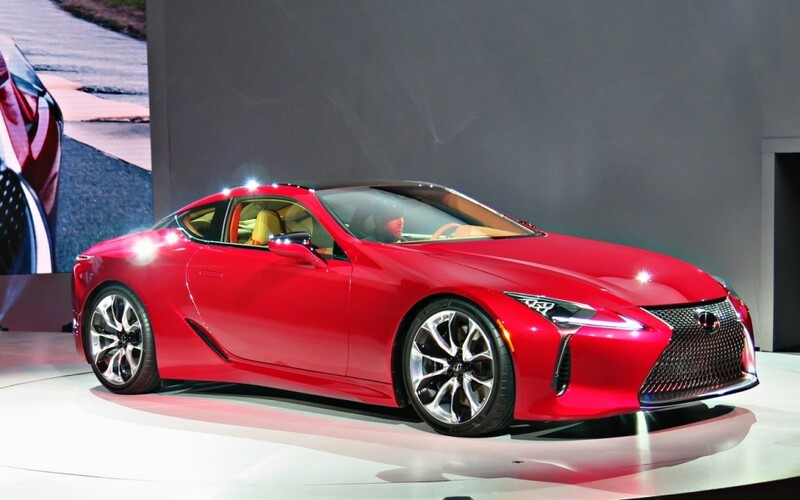 The Lexus LC 500, with a potent V-8 engine driving the rear wheels through a 10-speed transmission, is an almost exact duplicate of a concept car introduced at this same location in 2012 as the LF-LC. Toyoda-san has pursued the development of the LC 500 from that concept stage to production, personally ensuring that it remained true to the original goal of creating a new, more enthusiast-oriented reputation for the brand. He said the LC 500 makes a strong statement on the future direction of the Lexus brand. “This car is an important product for Lexus and me personally,” he said. The boss spoke repeatedly about the need for engineering and design to work closely throughout the development process, introducing the head of each of those departments during his talk. “This project was one of the first where designers were closely involved in the dynamic engineering development,” according to chief designer Tadeo Mori. From the signature “spindle” grille to the forged 20 or 21-inch wheels and chromed rectangular exhaust outlets, the L 500 shouts “look at me”. When its engine is fired up it also shouts – this time literally, with a deep-throated sound not normally associated with a Lexus. Inside, the LC 500 is focused on the driver. The front seat hip point height has been located as close as possible to the vehicle’s centre of gravity, providing the driver with very direct dynamic communication. The level of materials and the manner in which they have been applied is “Lexus-like” which is to say of the highest quality. The degree to which the development team pursued a driving experience unlike any previous Lexus is evident throughout. The LC makes the first use an all-new rear-wheel-drive platform, a global architecture (GA-L) destined for front-engine, rear-drive luxury vehicles. As much weight as possible has been positioned as low as possible, with wheels pushed to the corners and the drivetrain located behind the front axle line. Weight was a major consideration from the start. The trunk floor is made of a composite material, a carbon fibre roof will be available and that material is also used for the inner structure of the doors, which are clad in aluminum. Despite that weight-reduction effort, with the help of copious amounts of high strength steel, the LC500 has the stiffest body Lexus has ever produced. A sophisticated multi-link rear suspension has been developed for this car and engineers were said to have spent triple the usual amount of R&D time in pursuit of communicative steering. The engine is the same 5.0-litre, aluminumV-8 used in the RC-F and GS-F. Naturally aspirated and breathing through 32 valves, it produces 467-horsepower and 389-lb-ft of torque. A special exhaust system contains valves that are activated at start-up to produce a lovely growl. Under wide open throttle, the aural qualities are music to an enthusiast’s ears! Power goes to the rear wheels through a new 10-speed automatic transmission that is smaller and lighter than some eight-speed units. Lexus claims shift times match those of a dual-clutch transmission enabling 0-to-97 km/h (0-to-60 mph) times in the 4.5 second range.